Reliable, powerful yet safe, made in Italy with the best Italian/European components. ENG CRANES is an Italian company with over 30 years of experience in the designing and manufacturing of tower cranes. 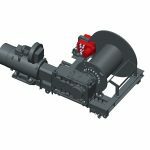 More than 10 years ago passion and the idea of creating their own range of hoisting winches brought their technical team to develop a range of winches from 3 to 133 Kw which can be applied to any machinery. And it wouldn’t be ENG CRANES if we were to do it just for ourselves which has led us to develop winches also on our customer’s request. As for all of our products our range of winches meet the CEE and standards.